CHARLOTTE, N.C.--(BUSINESS WIRE)--Level Brands, Inc. (NYSE American: LEVB) (the “Company”) announced today that it has signed a definitive merger agreement to acquire Cure Based Development, LLC the owner, operator and manufacturer of nationally recognized consumer cannabidiol (CBD) brand cbdMD, in a two-step merger for merger consideration of 15,525,000 shares of Level Brand’s common stock, with an earnout potential of up to an additional 15,525,000 shares if net revenue targets aggregating $300 million are met within 60 months of the closing date. The closing of the merger is subject to a number of customary conditions precedent as well as both the passage of the Agricultural and Nutrition Act of 2018, which is commonly referred to as the 2018 Farm Bill, or such other titled Federal legislation, which, when approved by the President of the United States, contains a permanent declassification of cannabidiol (CBD) as a controlled substance under Federal law. Formed in August 2017, Cure Based Development began reporting revenues in 2018 and for the eight months ended August 31, 2018 reported revenue of $3.2 million and in October 2018 had monthly sales exceeding $1.0 million. Cure Based Development’s current product offerings include gummies, tinctures, topical, bath bombs, oils, and pet products. Its products are available online at www.cbdMD.com or 700 stores in 40 states. Cure Based Development currently employs over 50 people in its corporate, manufacturing and distribution sites based in Charlotte, NC. “With the passage of the 2018 Farm Bill, CBD will no longer be listed as a Schedule 1 controlled substance which we believe will open the access to national retailers for CBD consumer products. We believe that the next three to five years will produce a few leading CBD brands, and our goal is to be the leader in the space,” said Martin A. Sumichrast, Chairman and CEO of Level Brands. Following the expected closing, the operations of Cure Based Development will continue under our cbdMD LLC wholly-owned subsidiary. In addition, Mr. Scott Coffman, the CEO of Cure Based Development, and Ms. Caryn Dunayer, its President, will continue in similar positions with our cbdMD LLC subsidiary. Following the closing, Mr. Coffman will also join Level Brands’ Board of Directors. Mr. Coffman founded Ecig Company Blu in 2009 and built it into one the leadings ECIG brands in the world before selling it to Lorillard Tobacco in 2012. In the event we complete the merger our combined company will be required to satisfy the NYSE American initial listing standards for the continued listing of Level Brand’s common stock following the closing. On December 4, 2018 Level Brands filed a Current Report on Form 8-K which includes a description of the material terms of the pending transaction as well as the merger agreement and other transactional documents. Investors are encouraged to read such filing in its entirety. Investors are also cautioned not to place undue reliance on the execution of the merger agreement as the material conditions precedent to closing are not within the control of Level Brands and, accordingly, the transaction may not be consummated. 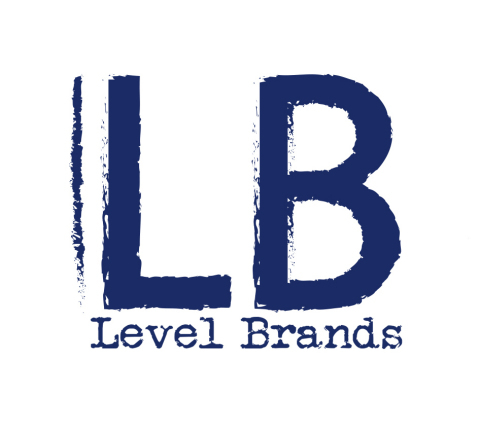 Level Brands is an innovative marketing and licensing company that provides bold, unconventional, and socially responsible branding for leading businesses. The focus of LEVB is licensing and corporate brand management for consumer products, including art, beauty, fashion, the beverage space, health and wellness, and entertainment. License brand marketing is at the core of the Level Brands businesses: kathy ireland® Health & Wellness, Ireland Men One and Encore Endeavor One (EE1). This press release contains certain forward-looking statements that are based upon current expectations and involve certain risks and uncertainties within the meaning of the U.S. Private Securities Litigation Reform Act of 1995. Such forward-looking statements can be identified by the use of words such as ''should,'' ''may,'' ''intends,'' ''anticipates,'' ''believes,'' ''estimates,'' ''projects,'' ''forecasts,'' ''expects,'' ''plans,'' and ''proposes'' and include the statement regarding the intended use of proceeds. These forward-looking statements are not guarantees of future performance and are subject to risks, uncertainties, and other factors, some of which are beyond our control and difficult to predict and could cause actual results to differ materially from those expressed or forecasted in the forward-looking statements, including, without limitation, the passage of the 2018 Farm Bill, the closing of the pending transaction and, if the transaction closes, the approval by NYSE American of the continued listing of our common stock and the perceived market opportunity for Level Brands, among others. You are urged to carefully review and consider any cautionary statements and other disclosures, including the statements made under the heading “Risk Factors” in Level Brands, Inc.'s filings with the SEC, including the Annual Report on Form 10-K for the fiscal year ended September 30, 2017 as filed with the SEC on December 26, 2017 and our other filings with the SEC. All forward-looking statements involve significant risks and uncertainties that could cause actual results to differ materially from those in the forward-looking statements, many of which are generally outside the control of Level Brands and are difficult to predict. Level Brands, Inc. does not undertake any duty to update any forward-looking statements except as may be required by law.